Let someone else manage and maintain your printers and copiers. You've got work to do. Managed document services (sometimes called managed print services) is a way to outsource the management of your print fleet (printers, digital copiers, fax machines, etc.). A step beyond leasing copiers or printers, you pay by the page and your service partner takes care of toner, maintenance, and print strategy, device setup, and document workflow recommendations. Basically, all you have to worry about is paper and staples. Still think a “just do it” approach to buying copiers and printers is a good idea? Many companies know they spend a lot on paper, supplies, toner, maintenance, and equipment and assume it's just the cost of doing business. Yet with all that spending, hardly ANY business knows how much it really spends to print and copy. Do you? Or do you know how much you spend on repairs? Or do you know why that printer in the hallway is there – and you've never seen anyone use it in the past year? Businesses need to print documents. You need to print invoices, marketing materials, customer presentations, reports, legal briefs, patient records, and all the rest. But just because you NEED to print doesn't mean you should pay too much to print your documents. 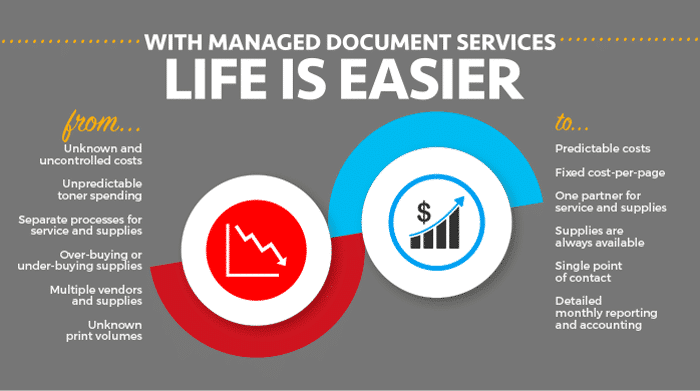 Managed Document Services will help your business control costs and increase productivity by identifying your real printing needs and matching the right equipment and software to meet those needs. Beginning with a print assessment, an MDS partner will drill to the core of what you need. You'll get the right mix of digital copiers, single-function printers, wide-format printers, etc. so that you can cost-effectively meet your business' printing and copying needs. Your MDS partner will ensure that you include your network-connected printers and copiers in your IT security plan. We'll also recommend appropriate authentication functionality on each device to ensure that confidential information isn't printed and left exposed for anyone to find in a printer's output tray. Allow departmental charge back, set quotes for departmental and/or individual printing, enforce printing rules that trim costs – managed document services keeps you from throwing away money on unnecessary printing. 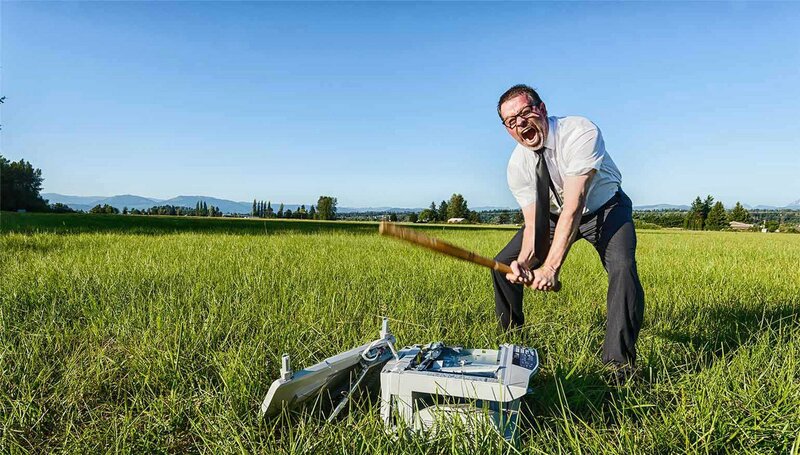 When something goes wrong with your copiers and printers, you have one point of contact to call to get them fixed. Easy-to-understand cost per copy charges and one bill that covers all your print output needs. Our invoicing is 99% accurate, so you won't waste time on annoying invoice questions. For many businesses, routine printer and copier issues consume a large amount of IT help desk time – up to 15% in many companies. With MDS, your partner troubleshoots your printing devices so your IT team can focus on delivering competitive advantage. Green is good for the environment and your bottom line. Replacing older, less energy-efficient equipment with newer, more efficient digital copiers and printers will cut your electricity bill over time. Print rules and effective monitoring of print jobs (such as default to duplex printing) will save paper. Your Managed Document Services partner continually monitors your equipments' status and automatically sends replacement toner before you run out. Allow users to print on the go and print from their mobile phones and tablets – safely and securely. Do you know where all your printers (and copiers) are? You press print, we take care of the rest.